I must admit that this generation of basketball stars are doing such a great job of representing the game, with the intensity that they bring the hype, and the rush but this would not happen if the the stars before them did not accomplished what they had. Early 90's was the era of the long rival Boston Celtics and Los Angeles Lakers this starts the period of grace for the game of basketball. The incredible passes where made care of Earvin "Magic" Johnson, amazing long shots and buzzer beaters that was shot by Larry "The Hick from French Lick" Bird these are the things that captivates the eyes of the all the basketball fanatics around the word. From the moment they enter the court this team mean business with one goal which is to win. Packed with determination and perseverance they also show how a team work was perfectly executed by distributing the ball around allowing everyone to scores. This was evident as most of their wins was more than 30 points and as high as 68 points when they drop Angola to a worst beat ever. 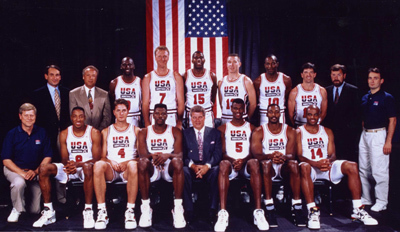 The considered to be the Original Dream was coached by a veteran coach Chuck Daily who directed the team as they conquered the world of basketball. Hype in the game of basketball started as before 90's with stars like Julius Erving, Wilt Chamberlain, Jerry West, etc. However the era where the considered to be the greatest of all time starts to achieved his goal during this era. 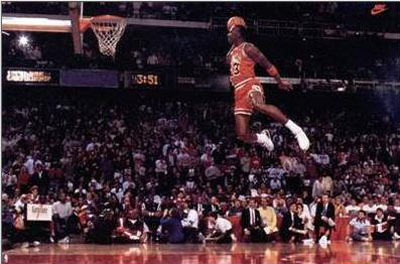 I am talking non other than your "Airness" Michael Jordan. Mj's basketball star was born when he was playing for North Carolina they make it to the finals and hits a crunch basket with just 18 seconds remaining on clock. They beat the Georgetown boys by 1 point with score of 63-62 in favor of North Carolina. Since that moment Michael Jordan did not look back and continues to showcase his talent as he entered the NBA in 1985. He stunned the crowed at their opponent with his flashy and high flying move earning his rookie of the year award and a back to back all star slam dunk champion. 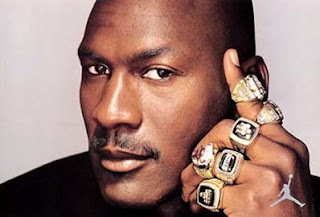 But the journey for the title of being the champion was not easy the Bulls which was his team constantly lost to the best teams at that time which include Celtics, Lakers, and Detroit which really push Mj and the Bulls to the limit. After all of the beatings that they suffered from rival teams finally the Chicago Bulls won their first ever NBA Championship thanks to the heroics of your Airness which broke the ice for the. Moreover, Mj's eagerness to win and take home the Championship trophy does not end in the 89-91 season it's just the beginning of his reign. Hard work and perseverance leads Mj and a bulls to a three peat as they won the succeeding 92-93 season, but it does not end there yet the team hunger for more championship makes them bag another three peat in 96-97-98 season. This was a great way to end off 90's with an incredible run by the Bulls and especially through the effort of the GOAT Michael Jordan who also won all of 6 finals Most Valuable Player honors. This era of basketball greatness was one of a kind. There are many teams of today's generation trying to mimic a three peat but all of them fell short and makes them feel that this is somewhat impossible. This males my proud to say that I was a living witness of the wonderful era of 90's where in i did not only witness a three peat but a double three peat which is kinda insane. Where to find NBA Cards?